From The Dark Knight Returns to the recent trailer for Batman v. Superman to even the latest comics, Batman has a long history of evening the odds through a power suit. Here’s the complete rundown of all the how and whys in those times Batman has had to upgrade to power armor. Watch The First Batman V. Superman Trailer In Full Glorious HD! Spoiler Warning: The end of this post will discuss the identity of the new armored Batman that will take on the mantle in June’s Batman #41. If you don’t want to know the character’s identity, avoid the “Power Suits for the Non-Batman” section. Before we go in, a few clarifications: we’re defining power suits here as exoskeletons and mechanically enhanced suits of armor. Over the years Batman’s standard Batsuit has evolved beyond cloth and spandex into a thin layer of protective armor, with levels of resistance far beyond its often skin-tight appearance. He’s also worn a variety of advanced high-tech suits over the years for different purposes that, while having various powers, don’t fit the descriptor of a “Power Suit.” So there won’t be anything like the Insider Suit, the Batman Beyond suit or the New 52-era Stealth Suit here. Let’s begin! Part of Batman’s everlasting appeal as a character has been the fact that he is merely human in a world of gods and superpowers. A highly skilled, extremely intelligent human backed by vast funds and high-tech gadgetry, but human nonetheless. Aa human raising up and defying the odds, it makes his victories against superpowered villains all the sweeter. But sometimes Batman has to become something more to face the deadliest of opponents, and that’s when power armor steps in. It allows Bruce to elevate himself to the level of his opponents physically, having already matched them in skill. It’s also interesting to note that most of the powered suits used in these situations have a connection to the Justice League in some manner (although not all). If it’s a problem that even the Justice League are struggling with, power armor is Batman’s best way to help even the odds. These sorts of suits are all relatively recent additions to Batman’s wardrobe, having come into use within the last decade. The Justice Armor (left), perhaps the sleekest power armor here, was introduced in 2007’s Justice #9 . The suit was designed not by Bruce but by the Metal Men, one of many for the Justice League to fight the Legion of Doom. 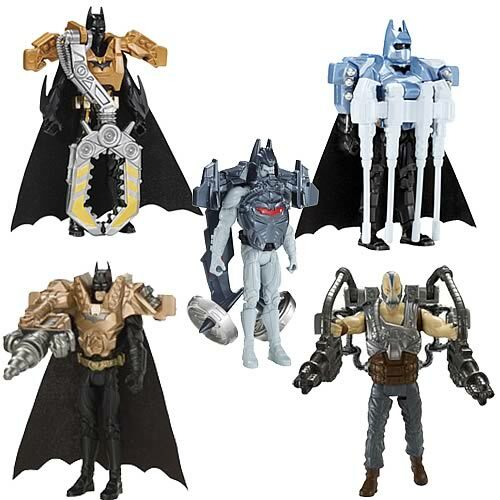 There was also the Hellbat suit (middle) introduced in Batman and Robin last year — designed by the Justice League themselves for Batman, the suit was made to fight the superhuman threats the Justice League were called upon to tussle with (the downside was it powered itself off Bruce’s metabolism, and could kill him if he used it for too long). Sometimes Bruce himself will design a power armor though, as was the case with a heavily armored, temperature resistant Thrasher Suit (in several incarnations) designed to go up against the near-immortal legions of the Court of Owls in 2012’s Night of the Owls (right). But not every superhuman encounter featuring a power suit takes place within DC canon — a grievously injured Batman was also forced to don a special power suit to fight a Predator (yes, that kind of Predator) in the 1992 crossover miniseries Batman Vs. Predator. Would you be surprised to hear that Batman won? Probably not. the mere existence of which is often a sore point among his allies. But occasionally Bruce realises he has to resort to enhancing his strength through power armor if stands a chance of confronting his godlike allies. 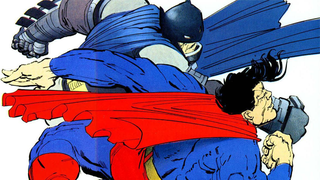 These instances are extremely rare, but one of them is perhaps the most iconic example of Batman in power armor — the smackdown between Batman and Superman in the iconic 1986 Frank Miller story The Dark Knight Returns. Following the Nuclear Winter brought about by earlier events in the story, the U.S. government tasks Superman with removing Batman from Gotham, and the two do battle with Bruce wearing an xxosuit over his usual Batsuit. The other is much more recent: in fact, it was introduced late last year in the comics. Dubbed the “Justice Buster” (perhaps a less than subtle allusion to Iron Man and his long line of buster armors), the gigantic mech suit (right) was called into action to fight members of the Justice League infected with a new strain of Joker Toxin. It was a suit of excess, with abilities designed to specifically combat each member of the Justice League, right down to fists imbued with microscopic red suns to combat Superman. Sometimes though, Batman’s turn to a Power Suit has not been to signify a position of strength, but as a symbolic recognition that the years have taken their toll on Bruce Wayne. In these instances, the suit is a mask. It allows an older Bruce, battered by his career as Batman, to still go toe-to-toe with villains. These suits become a tacit acknowledgement that Bruce can no longer really be Batman physically, facilitating the use of a mechanised body to make up for his own frail body. The prime example of this was the exoskeleton used by the alternate-reality Batman in 1996’s Kingdom Come (left). In a future where most of Batman’s crimefighting is done through an army of robotic drones, this Exosuit allowed an elder Bruce, crippled by years of injuries sustained as Batman, to occasionally head out onto the streets and still fight as Batman. There was also a brief appearance of another suit similar in design to this in the Batman Beyond episode “Disappearing Inque,” where the older Bruce confides in Terry McGinnis that before he retired from the Batman name altogether, he built an exosuit (right)to fight crime as he aged, but the stress of using it nearly killed him. Bruce brought the suit out of retirement to briefly do battle with the shapeshifting villain Inque. In times when Bruce has been unable to continue as Batman and the mantle has fallen to someone else, they have used Power Suits. For these armored Non-Batmen the power suit symbolizes an approach, a level of technological overkill that Bruce neither needs or wants to use. They beg the question: if someone acting as Batman has to resort to hulking suits of Armor, laden with firepower, are they still really Batman? In these cases, the presence of Power Armor symbolises that inherent difference between Bruce Wayne as Batman, and the people who try to be Batman in his stead. The most notable instance of this was when Jean-Paul Valley briefly became Batman following Bruce’s back being broken by Bane in the 1993 storyline Knightfall. Valley adapts a power suit (left) blending elements of the Batman and Azrael costumes to become Batman while Bruce is out of action, and due to his deteriorating mental state, Valley repeatedly redesigned the armor to include more and more lethal weaponry and engaged in the murder of his opponents, before he was defeated by a returned Bruce. However, a similar scenario is arising in the latest Batman comics as well. 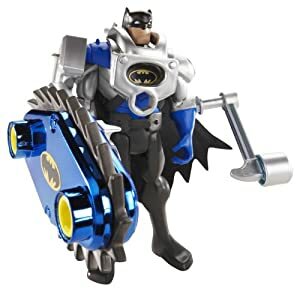 At the climax of the current story arc, Endgame, Bruce will somehow cast aside the Batman mantle, and replaced with a new Batman — a heavily armored mechsuit branded for the Gotham City PD, and piloted by none other than Jim Gordon (right). 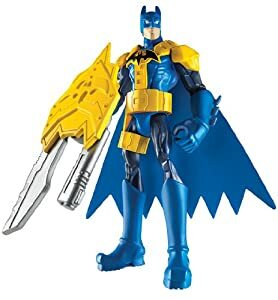 Although we’ve yet to learn how Gordon comes to the Batman name, it’s easy to see that this is a radically different Batman to Bruce’s ethos: with a gigantic sidearm and shoulder mounted Rockets, Gordon’s batsuit is a bit more firearm-friendly that Bruce has ever been. There were, of course, many, many more. 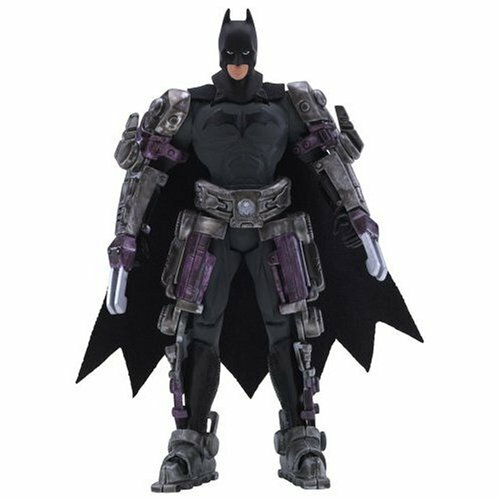 The power armor Batsuit is a relative rarity in the comics, but in action figures, it’s constantly popular!